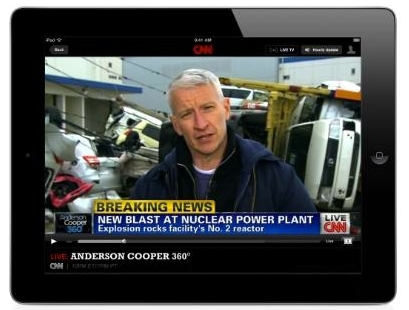 "CNN is the first 24-hour news network to offer live streaming of both the flagship CNN channel and CNN Headline News to iPad and iPhone owners, and at CNN.com/video, via the TV Everywhere initiative." If you don't know about the TV Everywhere initiative, you can read this article at Gigaom, but it boils down to having premium TV content available online as long as you can verify you have subscribed via third party sites, such as Dish Network or Comcast. I'm hoping eventually that you will be able to just subscribe directly to this premium content online instead of having to also have it set up on regular TV. I won't hold my breath, but I'm betting eventually it will get here, what are your thoughts?